For the many lovers of America’s national parks, 2016 is a milestone. The agency entrusted with both preserving and promoting those parks – the “crown jewels” of the most extraordinary landscapes and historic sites in America – celebrates its 100th anniversary this year. In the last two decades of the 19th century, and the first two decades of the 20th, Muir’s stirring books and his dogged advocacy spearheaded a national movement. Muir himself gained a nationwide following that reached as far as the East Coast and the White House. Among his influential admirers were Ralph Waldo Emerson and President Theodore Roosevelt. Bridal Veil Falls on the right and Half Dome in the background. Yellowstone National Park in the territories of Wyoming and Montana was declared the nation’s (and the world’s) first national park in 1872, but since there was no state government to manage it, the federal government did so. Yosemite National Park started as a state park even earlier, in 1864, in a grant signed by President Abraham Lincoln. The federal government donated land for the park to the state of California to be conserved in perpetuity. 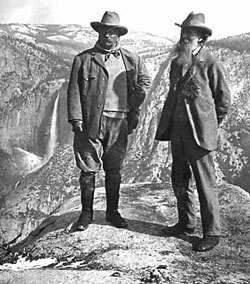 Yosemite was later returned to federal ownership and enlarged. Muir advocated on its behalf. at Yosemite’s Glacier Point in 1903. The Golden Bear State is blessed with more than its fair share of spectacular and superlative national parks, including Sequoia, Kings Canyon, Joshua Tree, Channel Islands, Death Valley, Redwood and Lassen Volcanic, among other national parks and monuments, in addition to the aforementioned Yosemite. Sequoia National Park possesses both the largest standing tree in the entire world – the General Sherman Tree, a giant sequoia – as well as the highest mountain in the United States outside of Alaska, Mount Whitney, at 14,495 ft. elevation. Redwood National Park contains the tallest redwood tree, which also happens to be the tallest tree on Earth. The lowest point in all of North America, the Badwater Basin, lies at 282 feet below sea level in Death Valley National Park. Badwater Basin in Death Valley National Monument, 282 feet below sea level. John Muir’s own home in Martinez, northeast of San Francisco, is now a national historic site managed by NPS. Here, on a recent visit I made, an interpretive ranger gave us an informative and personalized guided tour of where the conservation pioneer experienced wedded bliss, raised two daughters, managed a farm and planted a sequoia tree, which still grows today. We got to see his “scribble den,” the study in which he wrote most of his great paeans to nature and passionate pleas for its preservation. 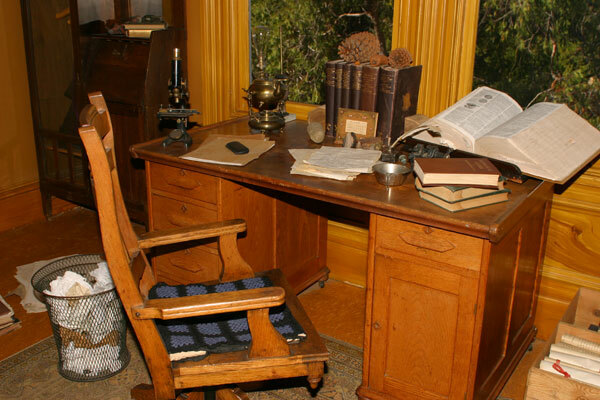 John Muir’s home in Martinez, Calif., now a national historic site. When President Wilson signed the Organic Act creating NPS in 1916, there were already 14 national parks, 21 national monuments and two reservations. NPS recorded 326,000 visits to those sites that year. manuscripts and maps on the floor. Now there are 410 units in the national system managed by NPS, and total visitation in 2015 topped 307 million, a record, as well as a five percent increase over 2014. No place exemplifies the sad phenomenon of crowding and overuse than John Muir’s beloved Yosemite Valley. For years I have avoided Yosemite in the summer months, when throngs of people and traffic jams convert it into more of an amusement or theme park than a national park. “When Christine Romalewski imagined her first trip to this national idyll, the New Orleans resident pictured remote lodges in a majestic wilderness. Deer and squirrels would be the only other creatures she and her husband, Rob, might encounter. 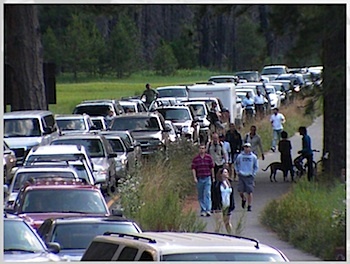 Traffic gridlock in Yosemite Valley. John Muir must be spinning in his grave at what has become of his cherished Yosemite Valley, where he once lived alone in magnificent solitude in a cabin he built by himself. With the popularity of the national parks and U.S. population both increasing with no letup, there is only so much the National Park Service itself can do to ameliorate a bad and worsening situation. A stabilized population in California and the U.S. as a whole would at least address one source of the increasing stress our national parks are under, not only from direct crowding and traffic congestion, but from development outside the parks (affecting scenic views from within the parks), increasing air pollution (which sometimes destroys views at such iconic sites as the South Rim of the Grand Canyon in Arizona) and climate change, among other threats. Bumpass Hell: a geothermal site in Lassen Volcanic National Park. In the meantime, Californians can still do what I did this August: enjoy one of the less-visited and lesser known but still outstanding national parks in the state. I appreciated the charms of Lassen Volcanic National Park in northern California. There were no maddening crowds and no snarled traffic to speak of. The beauty and wonder of its forests, geothermal activity and mountains, especially 10,463-ft. Lassen Peak itself, an active volcano which last erupted in 1915, were all of the highest order. It was a thoroughly enjoyable experience. And that’s what a national park visit should be all about: inspiration, not irritation.